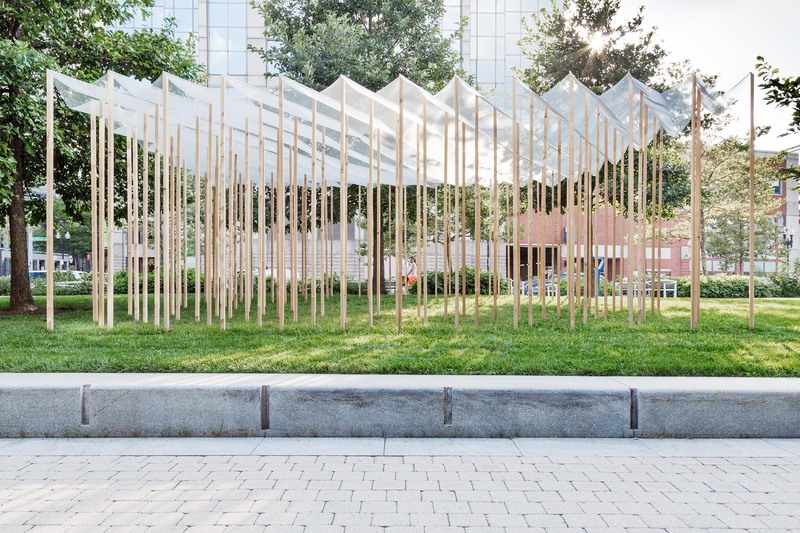 Pavilion for Design Biennial Boston. Most architecture is made out of planes. Plywood, sheetrock, glass. This one is different. It’s a solid made out of lines. It races from the first dimension to the third without stopping to catch its breath. An array of triangular columns form a square plan with a circular void cut out. An architectural primitive in every sense of the word. The devil is in the details. The grid appears normal, but falls in a quincunx pattern, creating a dialogue between triangle and square. The circular void forces slight deviations in the pattern: the square talks to the circle. This geometric game of telephone is juxtaposed with a rough materiality: knotty cedar posts, an aluminum mesh veil over the top. The experience is that of an abstract, diaphanous orchard with a clearing in the center where people can gather. Project Team: David Amdie, Po Ming Chou, Karin Hostettler, Wilfred Rodriguez, Nil Shu Shang, Alice Zhen.